Plans to build an endangered fish hatchery at Palisade High School are one step closer to reality. Students and staff raised $25,000 to convert an outbuilding into a new home for 500 razorback suckers. Renovations began this week. Once the building is finished and outfitted with three, 230-gallon tanks, Palisade High School teacher Patrick Steele and his students will start raising razorbacks and eventually release them into the nearby Colorado River. The project is years in the making, said Steele, and is only possible because of local organizations donating money for construction and professional development. A different group of Palisade seniors take charge of organizing the project each year. Students Dyllon Hoaglund, James Soria and Levi Van Pelt are working with Steele and U.S. Fish and Wildlife Service fish culturalist Mike Gross to move the project forward this year. Hoaglund said he was drawn to the project because it combined education and environmental protection. “Being able to encompass both is pretty outstanding and makes me proud to be a part of this project,” he said. Steele said he had a brief moment of panic when he realized that the project was actually going to happen and he would soon be responsible for hundreds of endangered fish. He’s now focused on how to weave aquaculture into different subjects, from science and math to art and social media management. A student even approached him about creating an Instagram account for the hatchery. As with construction, Steele said he’s relying on community generosity to fund teacher training and materials for the hatchery. He also wants to develop activities for elementary students who visit the hatchery on field trips. 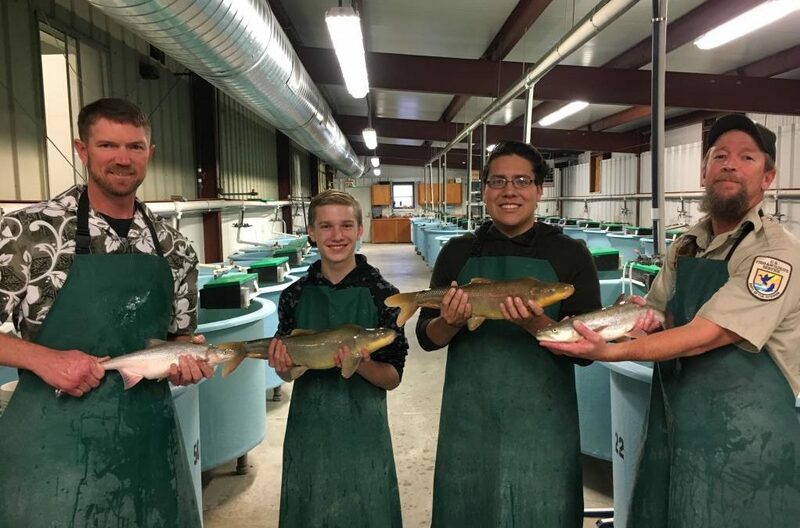 Later this month, a small group of teachers will visit a much larger school hatchery at Casa Grande High School in Petaluma, California, where students and staff are running a Chinook salmon hatchery that raises 20,000 fish a year. “It started like something we have and it turned into students graduating with certifications in cold water fishery culture,” he said. But for now, Steele said he’s going to focus on keeping the fish alive. U.S. Fish and Wildlife Service fish culturalist Mike Gross, center, breaks ground with students and teachers at Palisade High School on the site where the school is setting up a fish hatchery. If all goes according to plan, an outbuilding at Palisade High School will be teeming with hundreds of razorback suckers.